The Marilyn dress from Serendipity Studio http://www.sewserendipity.com/! I got this pattern last fall and I have been anticipating making it all winter! Here it is- version one. 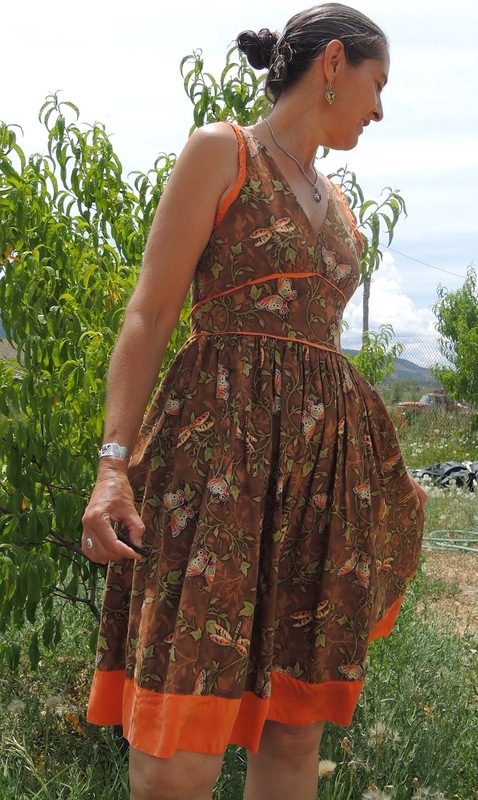 I actually finished this dress on July 3rd But I'm just getting around to blogging about it. I love the butterfly and dragonfly print on this quilting cotton. Quilting cotton in usually NOT what I want to make a dress out of because it can be stiff and itchy. sometimes I just can't pass up the prints because the quilters have all the cool prints around here. Quilting cottons are too itchy for me so I lined this dress with silk charmeuse. The orange silk charmeuse is luxuriously soft on the skin! I LOVE bias trim! Colette's book https://www.colettepatterns.com/books/colette-sewing-handbook has the best tutorial on bias trim! When you have struggled with making trim and bias trim without her tutorial and then you finally discover how it is done it seems like MAGIC!!!!!!! I like the v-neck back because it's easier to zip up. This is the first dress I have made that has a gathered skirt. Sometimes I like having a dress with a lot of room in the skirt because I may be at a music festival, friends back yard lawn, or at the park and need to sit down on the grass and have enough skirt to cover while sitting comfortably on the ground. However, I'm not so sure how I feel about the gathers yet. I'm not sure if I just have not warmed up to them or if I don't like the way they make me look? So free may you be about who you become."